Controversy ensued. Opponents of the project, including environmentalists everywhere and local First Nation’s groups whose reserves and livelihoods would be threatened, cited the inevitable pipeline ruptures and tanker accidents, such as the Exxon Valdez oil spill befouling almost 2,000 kilometres of Alaskan shoreline. Because of the project’s scale, a Joint Review Panel was appointed in 2012 to gather opinions from everyone involved, including citizens, scientists, industry leaders, and government officials. Their recommendations were to be submitted to the National Energy Board two years later, in 2014. Author Arno Kopecky, a staunch environmentalist, seized an opportunity to visit this area for a few months, interviewing as many locals as possible to better understand the potential impact of this project on the salmon, orcas, humpbacks, and humans who inhabit this unique ecosystem. His photographer friend, Ilja Herb, had just bought a 41-foot sailboat and was looking for an ocean-going adventure. Perfect! They would go together to the Great Bear Rainforest to document what had become a national controversy. Unfortunately, neither of them knew how to sail, thus providing a subordinate theme that weaves throughout their circuitous 800-kilometre trip from Sidney, on Vancouver Island, to Kitimat. Power and Sail Squadron members will appreciate the foolhardiness of such an adventure, especially since they would be sailing BC’s coast, an area beset with fog, storms, currents, tides, and reefs. But partly through luck, trial and error, patience to wait out weather windows, and a couple of week’s tutoring from a sailor friend, they managed to achieve their objectives: Herb took terrific photos and Kopecky recorded the mostly grave concerns about the project from locals. These blend together in The Oil Man and the Sea to present a compelling argument for the development of renewal energy sources to replace fossil fuels, which not only contaminate flora and fauna but contribute to global warming, placing our planet on course for disaster. 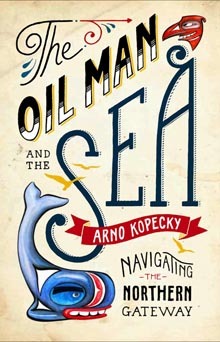 Based on his assessment of the Northern Gateway Project, the author summarizes with one word: “optimism.” Kopecky is tentively optimistic that the project will be scraped and the world’s largest remaining tract of coastal temperate rainforest will be spared from the worst excesses of modern man. Reviewer’s note: On June 17, 2014 Governor in Council approved the Enbridge Northern Gateway Project, subject to 209 conditions. Stay tuned.